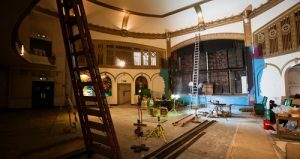 If you attended any of the Seattle International Film Festival screenings at the Neptune Theatre, you’d be forgiven for thinking it was business as usual at the venerable (est. 1921) cinema. In fact, the seats on the main floor of the University District landmark were loaners, the originals having been removed earlier this year by the Seattle Theatre Group, which had saved the Neptune from demolition (for a future light-rail station), in preparation for a conversion to a concert venue. The newly repurposed Neptune debuts Friday, June 17, with an appearance by a Seattle favorite, gloom-tinged singer Mark Lanegan (the seats remain for this one, which is 21-and-up on the main floor and all-ages in the balcony). The more intriguing bill this weekend might be Saturday’s pairing of Austin-based Okkervil River, whose new album “I Am Very Far” (Jagjaguwar) recalls The Cure at its most exuberant (literary-inclined frontman Will Sheff’s vocals also reach for the soaring melancholy of the late Jeff Buckley), and opener Titus Andronicus (speaking of literary), the hot UK band. Tickets are $20 ($22 DOS) and again the floor (seatless now) is 21-and-up and the balcony, all ages. For more information, click here. Upcoming shows of note at the Neptune include a reprise of the aptly named “Wine, Women & Song” (July 9), the women and song portion of which includes Ellensburg’s Star Anna (perhaps previewing her new album), Jewish reggae powerhouse Matisyahu (July 30) and Irish rockabilly/retro-pop vixen Imelda May (Aug. 12).